never give in except to convictions of honour and good sense." Two years ago, I spied the Holy Grail of Gardening in a garden catalog. Meconopsis beneticifolia. The Himalayan Blue Poppy. From the moment I laid eyes on it, I knew I had to grow it in my garden, and it's had this same effect on better gardeners than I. Ones that can actually grow it with seemingly no effort. Okay, so it wasn't easy for her either, but she has been successful. She lives in Nova Scotia, which has better than average growing conditions for this beauty, and she taunts us with it occasionally. 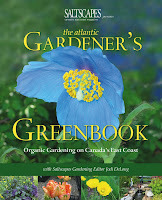 She even had the nerve to put it on the front cover of her book, The Atlantic Gardener's Green Book. But you know what? If I ever have it growing in my garden, I'll be showing it off, too. Last year, I tried growing Meconopsis by seed, inside. It germinated and I had tiny seedlings coming up in the seed-starter medium. They were so tiny that Romie, in his far-sightedness, could not see them even with his glasses on, but they were there. And then they weren't anymore. Such is the life of a Meconopsis grower. This year, I'm trying a different tack. I've read on Dave's Garden that a couple of people have successfully wintersown these things. One lived in New York and has a similar climate as ours. I've sown the seeds and they are now out in the 18° weather in their milk jugs. I planted two species this year: Meconopsis beneticifolia, which is the Himalayan Blue Poppy and the one I sowed last year, and Meconopsis x sheldonii, or Lindholm Poppy. Both are that luscious shade of blue that we pine for in a poppy. The Lindholm is supposed to be slightly easier to grow. We'll see. I'll be happy if I just get any. I laughed at the thought of blue poppies. I can't even get the common, run of the mill, orange poppies to grow in my garden. If a blue poppy ever showed its face in my garden I would know I was in heaven. Good luck with your quest. You would definitely have better luck with them than I becasue your weather is more like what they need. I hope they take for you. Well Kylee, lots of success and I'm keeping my fingers and everything else crossed that this time you will succeed! Good luck! We saw the Himalayan Poppies in the Seed Savers catalogue this year and are dying to give them a try. I hope yours do well for you! Since they are better suited to cold areas, maybe your milk jug method will help them out. Please taunt the rest of us that live in warm climates with your cold weather poppies. We need to be put back in our place every so often! I have always wanted to try growing these...not just because I love poppies, but I also enjoy a challenge. :-) I think winter-sowing just might be the way to go. Where did you get your seed? I wonder if they bloom early enough that they might make it??????? hmm. hope springs eternal. And speaking of spring, our springs are cool.... maybe I should try it. Keep us all posted on your progress! good for you, trying again (you're like me with the hollyhocks.) Here's hoping they do well--I haven't tried wintersowing anything, but they thing they do like best is fresh seed. Hopefully yours came in foil seedpackets, to help maximize freshness. I have my fingers crossed for you. I'll have to do a post about these bad plants, because they're so beloved--and so cantankerous! Great Blog! I too am a fellow DG'er. This is my first year winter sowing ... and I'm trying Meconopsis benticifolia. Love the blue poppy. I'm in zone 6b, hope it's not too warm to grow these beauties. I'm keeping my fingers crossed. I am also in love with ms (?) M.
I have had my Himalayan and Welsh poppies sitting outside in their seed tray since the 3rd January, and I think they are just starting to come though! I have more growth on the blue side (himalayan), but I have some tiny heads popping through from the yellow.